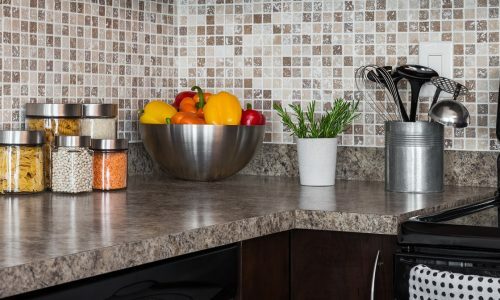 Update your kitchen worktop or refresh your stone floor without replacing a thing. A stone renovation can breathe life into tired stone, repairing cracks and chips and making a tired, dull finish shine. One of the most durable and hard-wearing natural materials, stone still needs a bit of care to keep it looking its best. Dark liquids, such as red wine or coffee, can stain porous stones like limestone or marble. Repeated rough use can dull the shine on a polished stone. Over decades or centuries the stone itself will wear away, leaving the uneven stair treads and paving slabs often seen in old churches and ancient houses. Stone renovation is the term professional stone workers use when we overhaul existing, already installed stone. This is typically stone used in home décor, such as a marble bathroom, a granite kitchen worktop, a stone floor or stairs. However, it also include other kinds of stone, including decorative moulding, bar tops and stone cladding. Renovating stone restores it to its former glory. A natural stone expert will assess the stone and its situation. They can then recommend a course of treatment which may be as simple as a professional cleaning and polishing or a more in depth approach. If there is specific damage to address, the expert may recommend dealing with cracks, chips or broken tiles before repolishing or refinishing the stone. They will often recommend a delay between the two processes, to give the stone time to settle, dry and cure. The finish on a natural stone is the final stage of the process. Stones of all kinds, from diamond jewels to granite worktops, are cut and polished to bring out their natural beauty. The finish describes the final cut style and effect. As an example, a marble worktop may be highly polished, to bring out the beauty of the stone, with decorative bevelled edges. The marble tiles on the floor of the same room may have a rougher finish, creating a non-slip surface, and no detailing. As stone is used day in, day out, the finish takes the brunt of the force. While the stone itself is not damaged, the finish can become rough, dull or uneven. Refinishing strips away the damaged top layer of the stone, revealing a new, unspoiled layer below. Often refinishing removes just a few millimetres of stone, and has an amazing impact. Many natural stones, including marble and limestone, are porous. This means that they can absorb liquids and tiny particles of food and other matter. Sealing the stone prevents this absorbtion, and can make the polished appearance of a stone last longer. Sealing a stone which has already been in use for some years is popular. It can help prolong the beauty of the stone, and the process can repair small chips and scratches, renewing the traditional high gloss finish of many natural stones.